1. 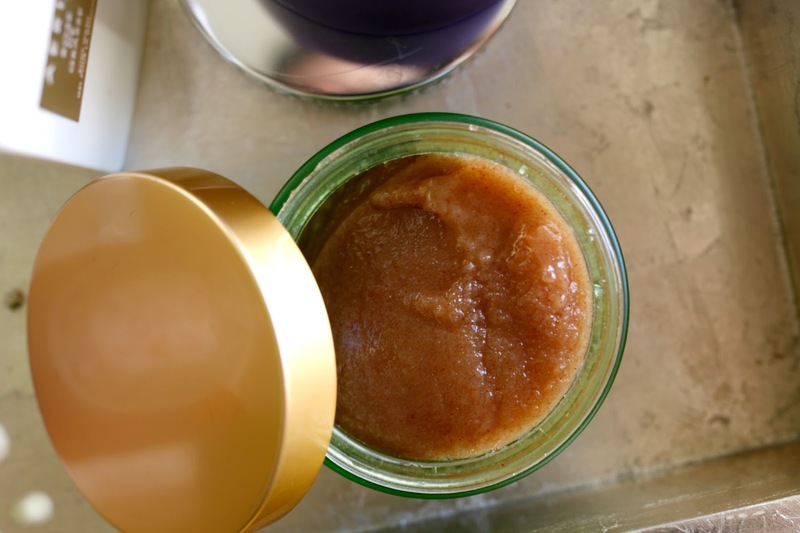 Molton Brown Ylang-Ylang Body Polisher - My favorite body care products are by far scrubs because there is such a feeling of instant gratification - smooth skin! This is the first product I have tried from Molton Brown and felt it is not only a great item to use on oneself, but would make a great gift as well. The texture of the scrub is dense with little to no oily runoff so it is easy to keep in the hand while massaging it around. What makes this different than many other scrubs I have tried is the strong aroma that actually lingers on the skin after it rinses off. Many scrubs polish the skin, but the yummy scent fades quickly. This fragrance is strong enough that I was able to forego any perfume after which is very rare for me. But even after a few hours, I could still smell (faintly but it was there) the delicate notes of the Ylang-Ylang in this particular scrub. Hostess gift, birthday gift, just because gift - this body polisher is perfect! 2. Cle de Peau Beaute Body Cream - There is body cream, and then there is the Cle de Peau Beaute Body Cream. Holy cow - this stuff is what luxurious decadent dreams are made of. The texture feels like the smoothest whipped silk and envelopes the skin immediately. I let it set for about 2-3 minutes so that it absorbs fully, but once it does my skin feels like it has been at the spa all day. Initially I noticed how long my skin stayed hydrated, because even 24 hours later it felt as if I had just applied it. The second thing I noticed was how firm my skin looked and felt, while also seeing a significant decrease in any swelling or puffiness. I can often wake up with my lower legs/ankles/feet a bit swollen, either from what I ate the night before or from not drinking enough water, and this has made a huge difference when I apply it before going to bed. Though it is super rich, I plan on using this a ton during the summer to help keep my legs (and arms/tummy/thighs/etc) in tip top shape. I guess I could also go to the gym to help with that, but let's focus on one thing at a time, k? 3. 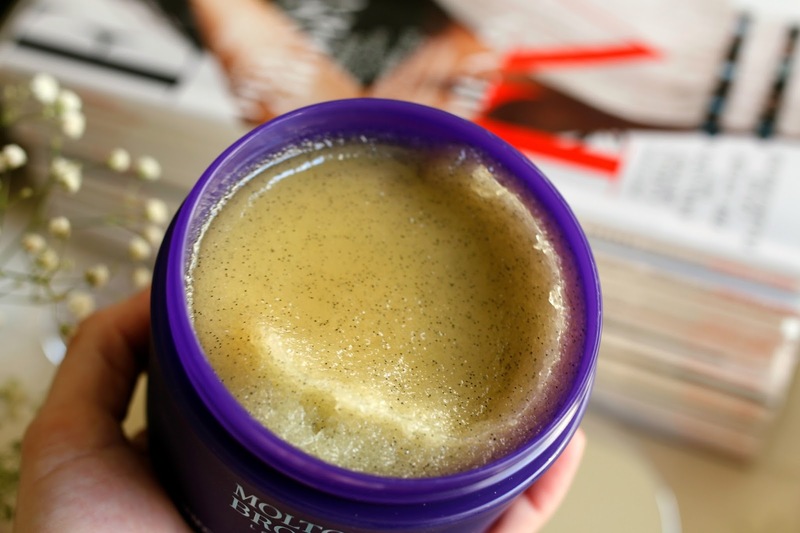 Tata Harper Smoothing Body Scrub - Give me all the Tata Harper products! I can't get enough! 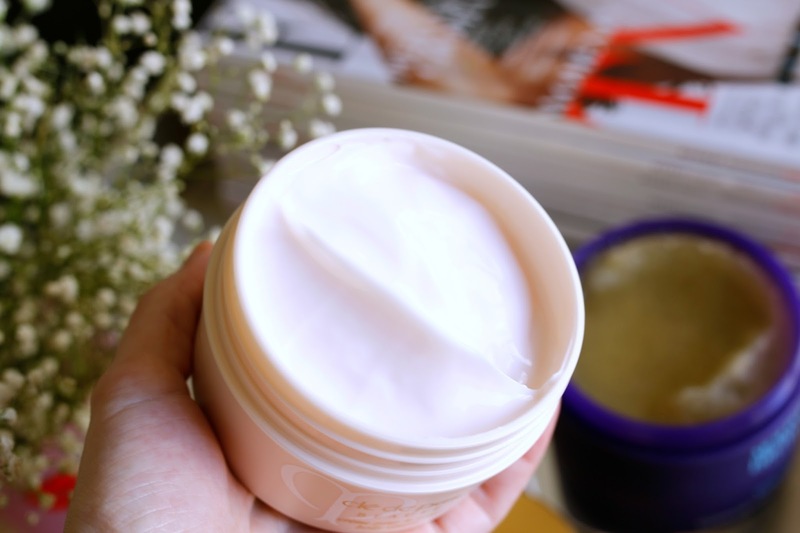 Though I have come to enough a multitude of different natural skincare brands over the past year (this one and this one are two that come to mind), Tata was really the gateway brand. I began using her products (beginning with the cleansers first - this one is my all time favorite) and have slowly branched out. Her body scrub is a mixture of both sea salts and sugars which I found very unique. The texture is incredibly thick - almost like a paste with which I like to massage into my body and leave on for a few minutes. I either turn the water off or step away from the stream and apply a hair mask, shave, etc to take up the time. Once I step back under the water, the scrub rinses away easily and what's left is skin that needs neither body lotion or cream after because it feels so incredibly hydrated. The scent is pleasant and aromatic, but not overwhelming. It doesn't linger on the skin like the Molton Brown, but I find that it's great at helping soothe my skin when it feels irritated or itchy from dryness. If you are thinking of venturing into the Tata body care product range, this is the perfect one to begin with. 4. Aerin Rose de Grasse Body Wash - If you remember this post and this video, Aerin's Rose de Grasse fragrance is one of my all time favorites. The rose scent is one of the most pure and sophisticated formulations I have ever come across. Naturally, I want all the ancillary products that go with it and was thrilled to see in addition to a body wash, there is a body cream and candle to complete my full infatuation. The body wash itself is a clear gel that only gives a mild foam so as not to strip or dry out my skin, but the real winner is the scent which is the perfect base to layer with the cream or fragrance. Basically I would be happy smelling like Rose de Grasse head to toe every single day if it came down to it. That is how much I love this fragrance. And for those that are not a huge rose fan (I wasn't either before this), I encourage you to give this a second look. It could change your entire opinion of rose scents. 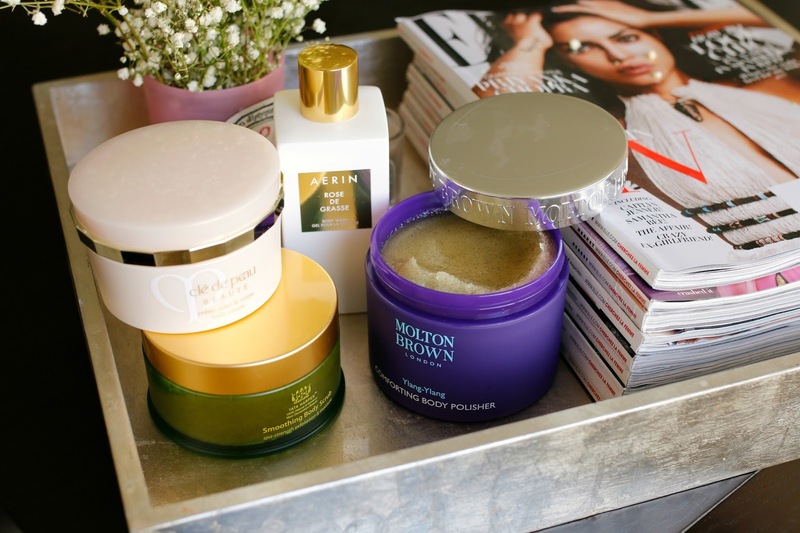 These all sound amazing, The body polish especially. Will defiantly have to try! Gosh, both the scrubs sound really good. Ive been using one from Aveda and its just not doing the trick. I've gotten myself into a bit of a love affair with Aerin products, starting with their amazing rose lip balm.